Since it's the middle of the year AND a 5th Sunday, I thought a mid-year review game using flashcards would be fun (because those kiddos are seriously missing school and all that learning, right?)! It's really simple. 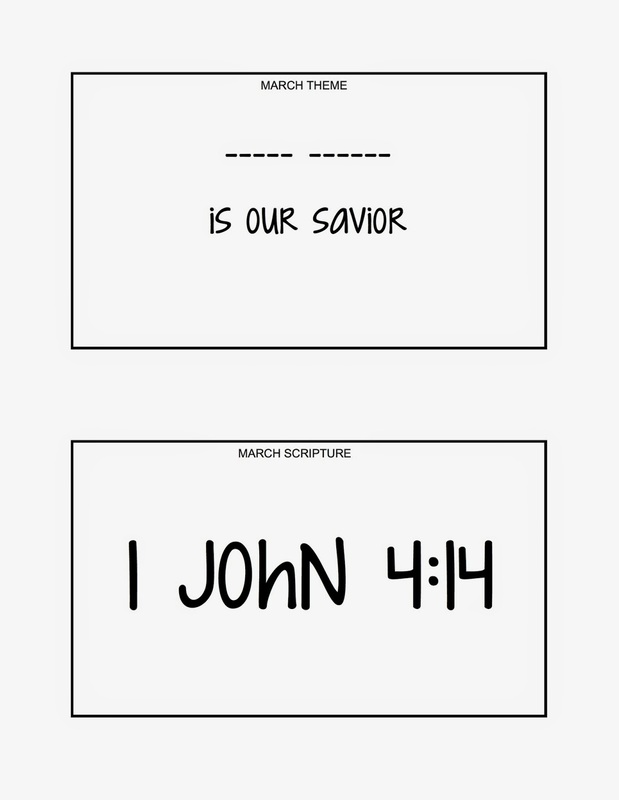 Print my flashcard document HERE. I printed mine on a fun yellow but not mandatory ;). Cut them in half and shuffle the cards. For Senior, divide the primary into 2 teams. If you have a large primary, divide into more. Each team will have a bell to ring (I just use 2 of my handbells but any bells will do) placed in front of the room. Draw the first card and face it to the team. The first team to ring their bell with the correct answer wins that card. If the answer is incorrect, the next team to ring the bell gets to answer and possibly win, etc. For Junior, there will be no teams and no bells. I'll give as many hints as possible and we'll try to solve the card together. 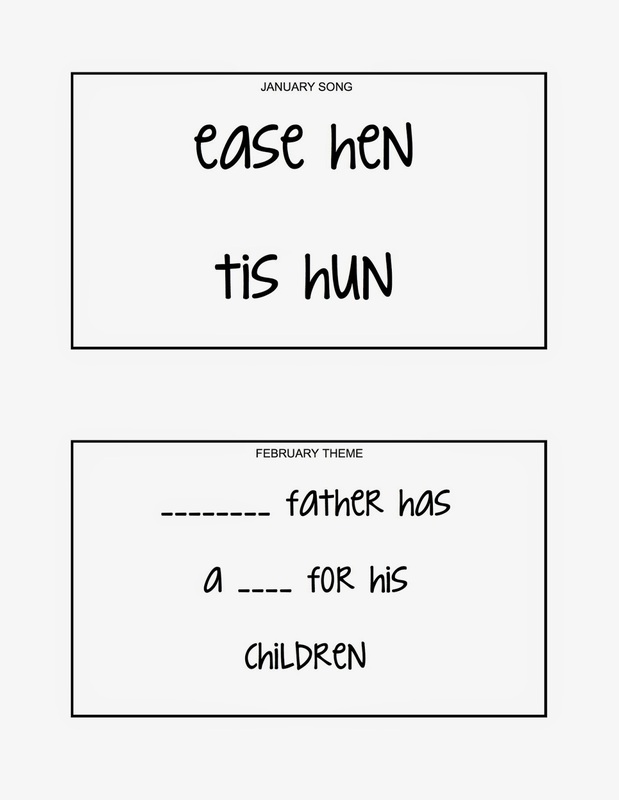 Monthly Theme Cards: Fill in the correct missing words (I plan on keeping my 2014 outline handy as all the answers are easily found there!). 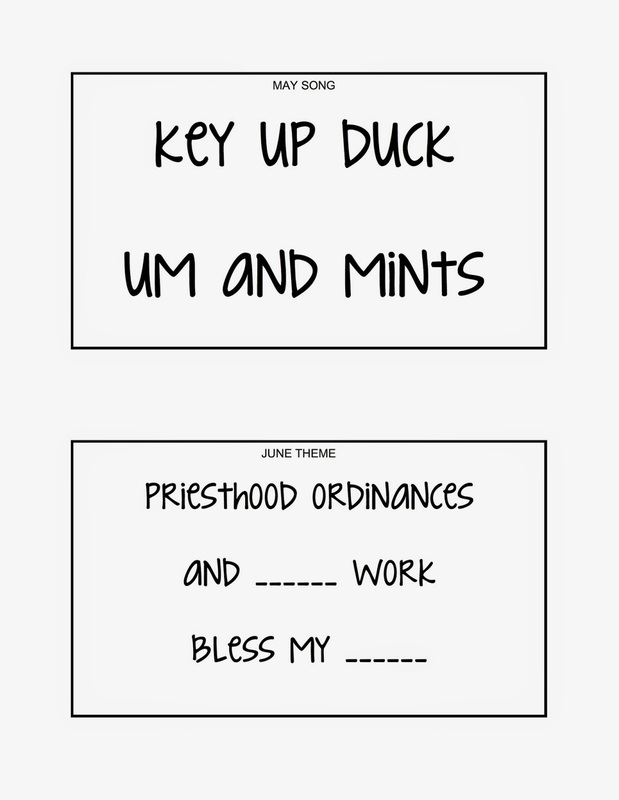 Monthly Song Cards: They are the Mad Gab/Mumbles game that has been all over the FB Chorister's group. HERE's the link to the search I did to come up with my titles in case you have different songs and need to make your own (if you scroll down a bit, there's a link with almost all the songs in the songbook). The kids will have to figure out which song it is. When it's been guessed, sing the song. 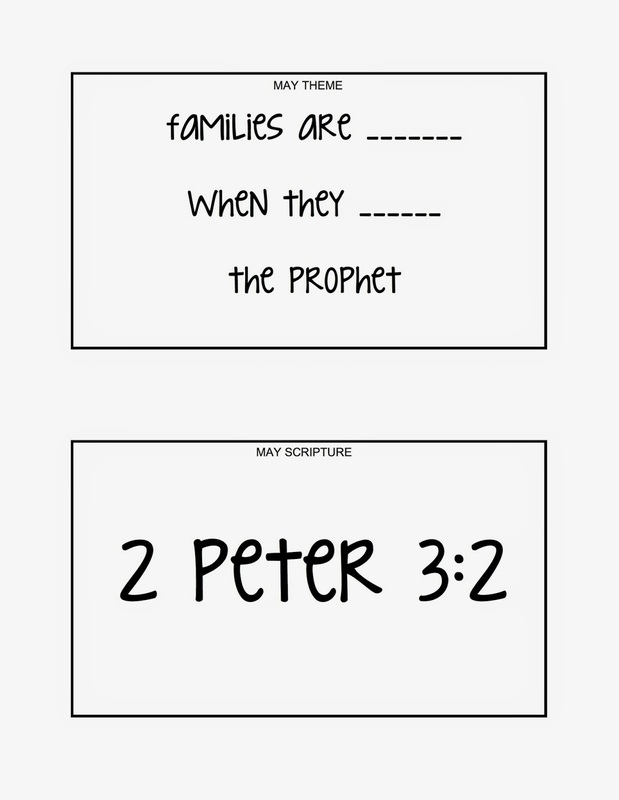 Monthly Scripture Cards: For Senior Primary, it is a scripture hunt. The kids have to find the scripture passage in the scriptures and read it (you may need to get a few sets of scriptures from the library). 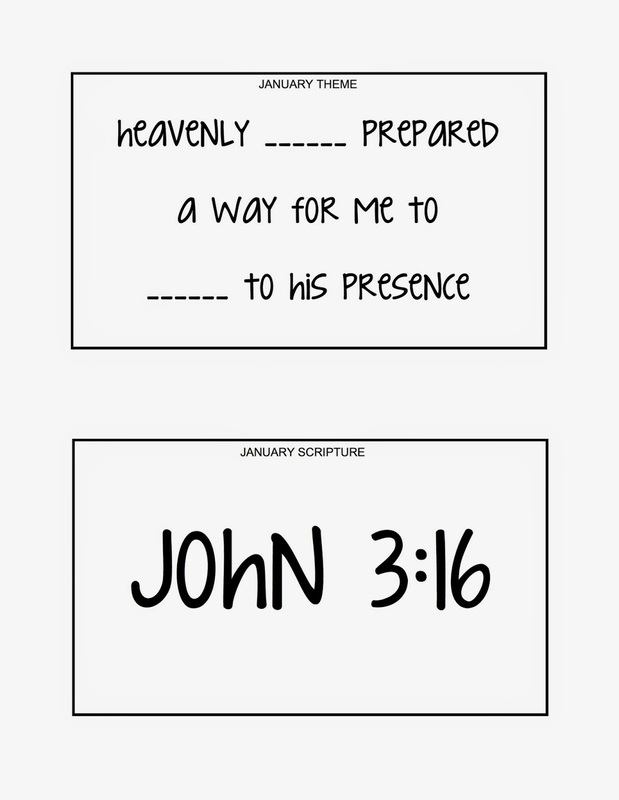 For Junior Primary, I'll just pick a child to help read the scripture (again, the 2014 outline will help here as well). 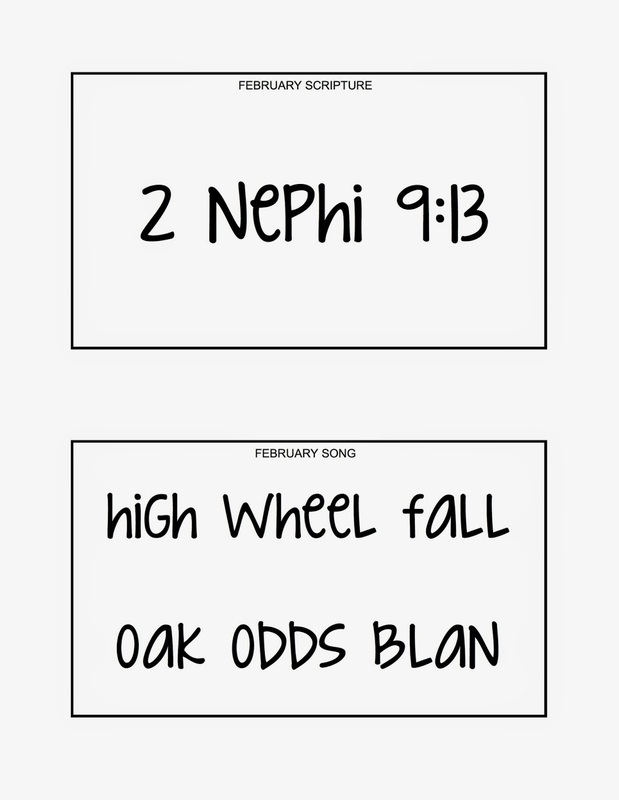 If you are short on time, I'd omit all the Monthly Scripture Cards. If you are even shorter on time, omit the Monthly Theme Cards as well! 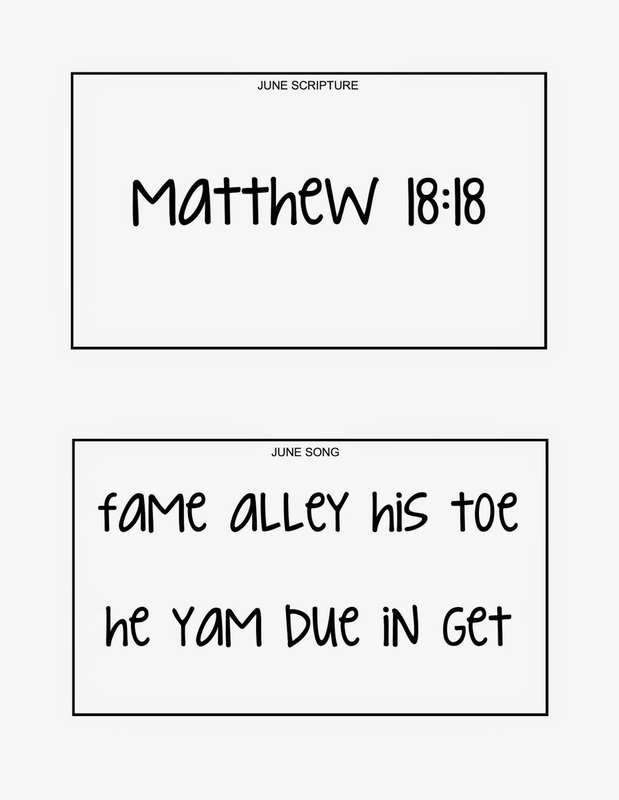 Do you know the name of the file for the mad gab songs in the Facebook group you mentioned?